Born in Nebraska, moved to Manhattan Beach California when I was six. Lived in Manhattan Beach from grade school through High School. Married at age 20 in 1962. Had two children, was married 22 years, got a divorce in 1984. Married a Christian man in 1988. I have been married to my second husband for 30 wonderful years. The following is our blended family: My husband has three children and I have two. He has five grandchildren and I have two. Together we have TEN Great-Grandchildren. We have a big blended family!!!! We moved from California to Boulder City, NV in 2001. We have been blessed with many friendship through the years. Boulder City will always be our home. Please tell us about the book you’ve written and a short synopsis. “Planting Seeds of Hope” is my testimony of how God’s grace saved me from years of insecurities, dysfunctional relationships, self-esteem issues, emotional insecurities, and codependency issues. Growing up in an unstable household gave me an early look at an unhealthy family environment. I grew up to find myself in problematic and emotionally destructive relationships throughout my childhood and young adult life. Without direction, I wandered through life without the Holy Spirit to lead the way. Even though Christ was with me throughout my young life, I failed to notice Him until my eyes were opened to His presence. I learned to accept who I was on a journey to self-discovery that prepared me for God’s purpose in my life. My book is meant to encourage healing, learning, and growth in God’s ultimate purpose. You can get a copy of Joyce’s book at Barnes & Noble HERE. Knowing and understanding what the Lords purpose for my life. Experiencing the healing He was doing with so many of the women that participated in Transitions. [A nine week support group at the Central Christian Church in Henderson] The recognition and comments of the pastors and counselors. They knew that only Christ could bring the hope that the women were getting out of the class. He gives us his unconditional love, so He can pass it on by sharing our testimonies. 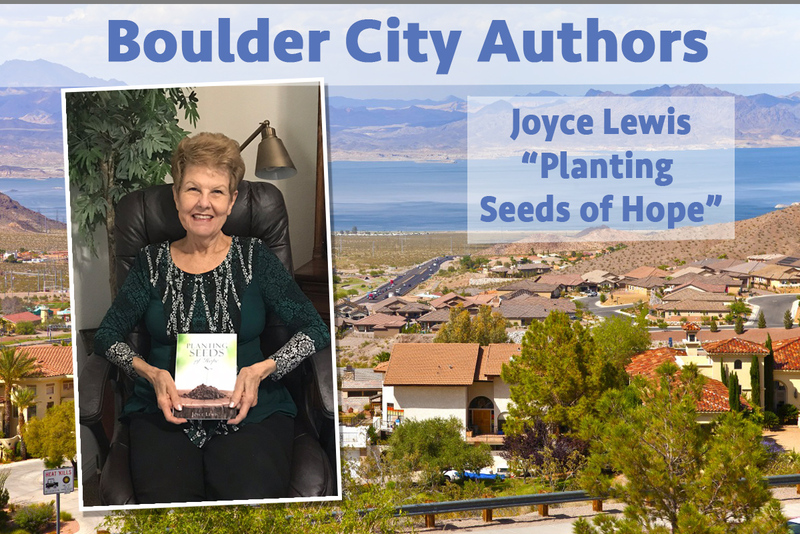 My purpose for writing “Planting Seeds of Hope” was to share my testimony to give people the only Hope in the world, which is found in the Gospel. After twenty years of Studying and 24 week coarse in Theology and Phycology, at the Renewing Live Christian Counseling Center; I have come to the conclusion that Christ is the peace we seek, the light to guide our way, He is the Savior who came to save us from our sins. This is what I pray that readers realize how much Jesus wants a relationship and how much He loves them!! I starting writing in 2014. It took me two and half years before I got my first book. It was a long process and a lot of rewriting. I had never written a book or taken formal classes. I read several books on how to write a book, which helped. I felt it was important for me to go to a Christian publisher and get professional help. I was blessed to get a special Ministry price. For first time writers, I do recommend a complete editing package. The editing of my book was a big part of its success. The extra money that it cost was worth it. My book is a biography of my life, which contributed to me becoming an author. The whole story is in “Planting Seeds of Hope”. Outline your chapters first (from the beginning of your story to the end). Give each chapter a title. You will change your mind about the sequence and even the titles, but you have to start some where. Write when it feels right. When you are relaxed and comfortable. Take breaks when you are running out of steam, I have taken two day breaks. Be consistent, find the best time and place to write. We have lived in Boulder City for sixteen years. What I like most about Boulder City is the people!!!! We have so many friends here who have been such a great support for my husband and me. Boulder City is home to me, even though all our families live in different states. My life story is in my book. My husband and I just celebrated our Thirtieth Wedding Anniversary. We have had a blessed life together. One of the chapters in my book is “The Story of Us”!!! social time and I will be doing book signing. This book would be a perfect gift for yourself or a friend/relative. Email me at: Joymlew@yahoo.com or Phone – 702-293-0740. Include you friends, just let me know how many.